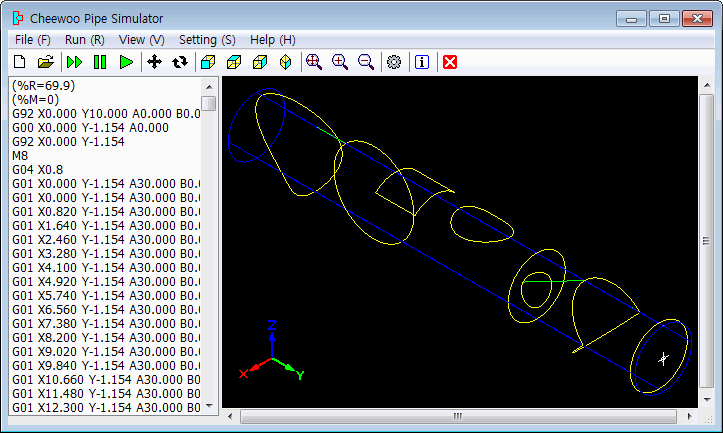 Simulating 2~4 Axis 3D CNC pipe profile cutting path, lead-in/Lead-out and cutting sequence from the NC code file. Showing NC block progress sequence from 3D display window. Supporting NC block progress sequence speed adjustment for easy checking. Supporting zoom-in, zoom-out, panning, rotation, front view, top view, side view, and bird's eye view for user to check 3D NC cutting path easily and conveniently. 3D NC cutting path display window and NC code list window are automatically synchronized. Adding pipe radius and circular direction output mode information in the NC file as a header, it is possible to set pipe raduis and circular direction output mode automatically. Requires Windows 2000 or above, RAM512 MB,10MB HDD or above. Pipe CNC Cutting,Simulation,G Code,CAM,CNC Simulating and displaying CNC cutting path movement for checking it before real CNC cutting started. Supporting zoom-in, zoom-out, zoom-extent, rotation and NC block progress speed adjustment.